From a consumer's perspective, the search engines vary from one portal to another and are often feature-based, instead of need-based. A consumer might be looking for an economical car to be used for daily commutes and occasional road trips in the summer, but is forced to look for that car based on technical details such as engine size or CO2-emissions. To help boost the lead generation from car portals, Käyttöauto started using giosg platform across all car portals. 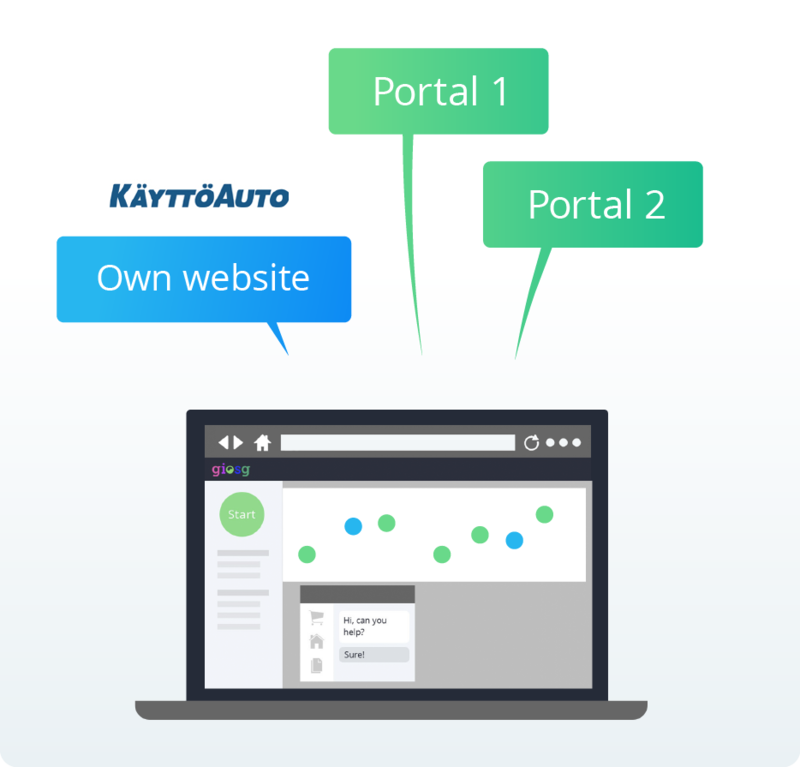 Our platform gives Käyttöauto a real-time access to all portals' subpages that feature their car within a single view. Käyttöauto uses this access to start chat conversations with consumers who are deemed as potential, committed buyers. During the chat conversation Käyttöauto's sales manager interviews the visitors about their true needs and aspirations for the car, leaving the technical details aside. The sales manager then proceeds to recommend cars from Käyttöauto's own selection and suggest test drives or car valuation meetings, pushing the lead forward in the sales cycle. Recommending cars from dealer's own selection creates a lock-in for the car portal visitor. Being able to recommend cars from their own selection, Käyttöauto has been able to lock the casual car browser better into their car selection significantly boosted lead generation form car portals in the process. Meanwhile, the consumers on Käyttöauto's portal adverts have gotten personal recommendations on car matching their need, leading to more informed decision-making and, ultimately, happier customers.